Oregon’s share of Interstate 5 runs neatly down the length of the state, from the south side of the Columbia River all the way to the California border. It’s mostly straight, mostly flat, and you can drive its 308 miles in just under five hours. But why would you want to? I-5 is packed full of family fun, most of it close enough to be visible from the freeway. From theme parks to animal parks, fish ladders to fairy tales — it’s all just an exit away. So buckle in as we count down the miles, heading south from Portland. It’s no accident that the Family Fun Center’s brightly colored miniature golf course, complete with pennants flying from a teeny-tiny castle, is placed invitingly next to the freeway. The golf may be the reason to stop, but it’s just one of the reasons to stay. 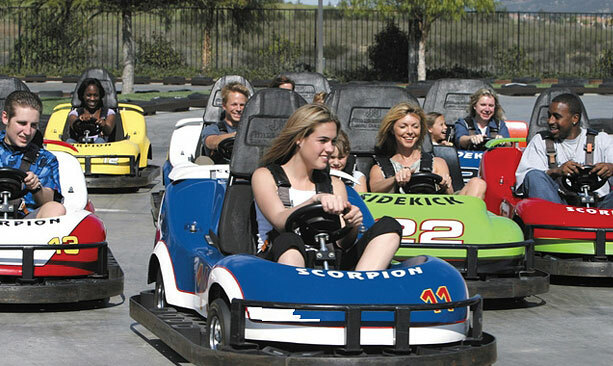 The six-acre complex includes go-karts, bumper boats and batting cages outside, and Bullwinkle’s restaurant and two-story arcade inside. We kept busy indoors. My teenage travelers chose a rousing game of laser tag, while I checked out the more sedate play land for the little kids. On the banks of the Willamette River under the Marion Street Bridge awaits a two-for-one treat for visitors that could easily take up your entire day: Riverfront Park and A.C. Gilbert’s Discovery Village. After arriving at the park, my group immediately headed for the enclosed Riverfront Carousel, where we went round and round for almost an hour. After taking reluctant leave of the enchanting horses, we headed over to A.C. Gilbert children’s museum, a collection of historic buildings housing interactive exhibits and anchored by an amazing playground, complete with the world’s largest Erector-set tower. If fairy tales could come to life, they would be played out in the Enchanted Forest, a magical place of cottages and gingerbread houses nestled on the side of a mountain. 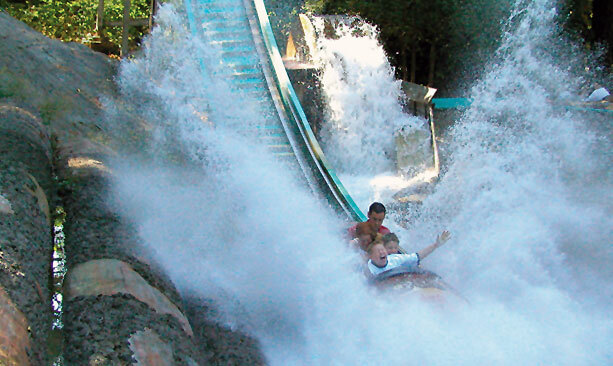 The 20-acre theme park is a labor of love for the local Tofte family, who have been steadily adding attractions since the park opened in 1971. The original attraction is still the favorite—Storybook Lane, where kids can crawl through Alice in Wonderland’s rabbit hole and stagger through the crooked house (where the crooked man lives). The park is also home to a Western town, an English village, a roller coaster, bumper cars and the Big Timber Log Ride. Bring your lunch — picnicking is encouraged. It’s worth the four-mile journey to see the old railroad town of Brownsville, which houses the Linn County Historical Museum in an old train depot and adjacent boxcars. Volunteers also guide tours of the 1881 Moyer House. 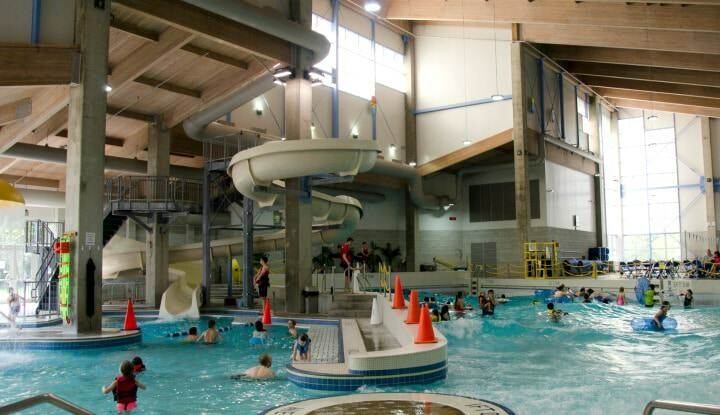 No matter what the weather is like outside, the water is always warm and inviting in the year-round indoor water park at Splash! at Lively Park. There’s concessions, a sundeck, slides and waves galore. Known up and down the West Coast as “that ice cream place on I-5,” K&R Drive-In stays busy all day serving freeway motorists. There are no bathrooms and no indoor seating, but the travelers lined up for burgers and local Umpqua ice cream don’t seem to care. We ate towering ice cream cones under the classic and curiously generic drive-in sign while waiting for our burgers and fat steak fries. Chocolate hazelnut won my vote in our little flavor contest. The Winchester Fish Ladder is definitely under the tourist radar, but it’s one of the most fun — and free — things you can do off I-5. As we started the climb down from the parking lot above the North Umpqua River to the Winchester Dam, we passed two dads lugging a toddler each. “Lots of fish today, big fish,” one said in passing, as his daughter vigorously nodded her head. “Big fish,” she echoed with a grin. And that’s what we found after descending several steep sets of stairs — lots of big winter steelhead on the other side of the plexiglass-enclosed viewing area. 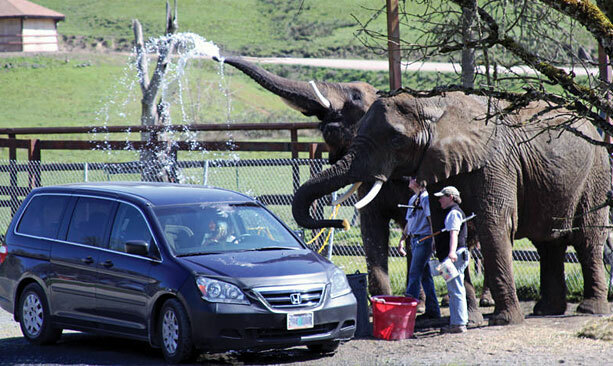 Wildlife Safari is a favorite destination for I-5 travelers and local residents alike. Here, there be lions and tigers and bears — and cheetahs, camels and giraffes, too. You can see all of them on a leisurely 4.5-mile drive through the compound. Or park the car and visit Safari Village’s free petting zoo (beware of the llama – she spits) and take a ride on the Safari Train. Be sure to check out the activities board; the elephants are known to throw a car wash every once in a while. In Oregon’s olden days, the Wolf Creek Inn welcomed weary stagecoach passengers traveling the California-Oregon Stage Road. It still serves trans-state passengers today, even if their mode of commute is a little more mechanized. The Oregon Parks and Recreation Department, which owns the inn (along with the nearby ghost town of Golden), completely restored the nine guest rooms to their former glory. Don’t count on checking e-mail — rooms have no Internet access, phones or televisions, all the better to immerse visitors in the past. You can get online down the road at Valley of the Rogue State Park, courtesy of state-sponsored wireless Internet. The park, which lies along the Applegate Trail route, has three miles of shaded frontage on the famous Rogue River. I like to stretch my road-weary legs on the River’s Edge Trail, which leads to a salmon and wildlife-viewing platform. Camping opportunities abound, including six rental yurts. A trip through Southern Oregon would simply not be complete without visiting one of the state’s more quirky attractions — the Oregon Vortex, a house of crazy angles that has been baffling visitors since it opened to the public in 1930. The tour guide tells visitors that a “spherical field of force” causes the dizzying phenomenon, but I think seeing a golf ball roll uphill defies all explanation. Ashland’s ScienceWorks is my favorite kind of museum — the “please touch the exhibits” variety. The hands-on museum has activities (including a pedal-power railroad) for all ages; there’s even an area exclusively for the three-and-under set. After leaving Ashland, there are only a few miles of Oregon road left, most of it going straight up. On the other side of the Siskiyou Summit, you’ll find the “Welcome to California” sign. Then it’s time to stop, reset the trip meter and turn around. Road trip, part two!